June 3 is the 154th day of the year(155th in leap years) in the Gregorian calendar.There are 211 days remaining until the end of the year. 1098 – First Crusade – The Sack of Antioch follows the Siege of Antioch. 1965 – The launch of Gemini 4 , the first multi-day space mission by a NASA crew. Ed White, a crew member, performs the first American spacewalk. Year 350 (CCCL) was a common year starting on Monday of the Julian calendar. At the time, it was known as the Year of the Consulship of Sergius and Nigrinianus. The denomination 350 for this year has been used since the early medieval period, when the Anno Domini calendar era became the prevalent method in Europe for naming years. Roman usurpers were individuals or groups of individuals who obtained or tried to obtain power by force and without legitimate legal authority. Usurpation was endemic during Roman imperial era, especially from the crisis of the third century onwards, when political instability became the rule. Julius Nepotianus, sometimes known in English as Nepotian, was a member of the Constantinian dynasty who reigned as a short-lived usurper of the Roman Empire. He ruled the city of Rome for twenty-eight days, before being killed by his rival usurper Magnentius' general Marcellinus. Year 20 BC was either a common year starting on Wednesday or Thursday or a leap year starting on Tuesday, Wednesday or Thursday of the Julian calendar and a common year starting on Tuesday of the Proleptic Julian calendar. At the time, it was also known as the Year of the Consulship of Appuleius and Nerva. The denomination 20 BC for this year has been used since the early medieval period, when the Anno Domini calendar era became the prevalent method in Europe for naming years. Year 1139 (MCXXXIX) was a common year starting on Sunday of the Julian calendar. Year 628 (DCXXVIII) was a leap year starting on Friday of the Julian calendar. The denomination 628 for this year has been used since the early medieval period, when the Anno Domini calendar era became the prevalent method in Europe for naming years. Liang Shidu (梁師都) was an agrarian leader who rebelled against the rule of the Chinese dynasty Sui Dynasty near the end of the reign of Emperor Yang of Sui. He, claiming the title of Emperor of Liang with the aid from Eastern Turkic Khaganate retained the modern northern Shaanxi and western Inner Mongolia region for over a decade, but was gradually weakened by attacks from Tang Dynasty, whose founding emperor Emperor Gaozu and successor Emperor Taizong had eliminated the rival contenders for power one by one, leaving Liang isolated. In 628, with the Eastern Turks in internal turmoil and unable to come to his aid, Emperor Taizong launched another attack on Liang. Liang's cousin Liang Luoren (梁洛仁) assassinated him and surrendered, completing Tang's drive to reunite China after Sui's collapse. Saint Kevin is an Irish saint, known as the founder and first abbot of Glendalough in County Wicklow, Ireland. His feast day is 3 June. Ovidius, also Saint Auditus, is a Portuguese saint. According to hagiographies of the 16th century, Ovidius was a Roman citizen of Sicilian origin. Tradition states that he was sent to Braga by Pope Clement I, where he served as the city's third bishop around 95. He is said to have baptized Saint Marina and her sisters after they were abandoned by their mother. The Theotokos of Vladimir, also known as Our Lady of Vladimir, Vladimir Mother of God, or Virgin of Vladimir is a medieval Byzantine icon of the Virgin and Child. 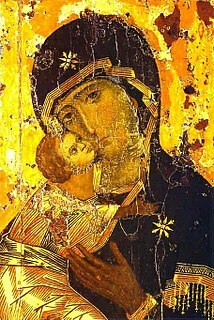 In 1169 Andrei Bogolyubsky sacked Kyiv, and, after plundering the city, stole much religious artwork, including a Byzantine "Mother of God" icon which was transferred to Vladimir. It is one of the most venerated Orthodox icons and a fine and early example of the iconography of the Eleusa (tenderness) type, with the Christ child snuggling up to his mother's cheek. The Theotokos is regarded as the holy protectress of Russia. The icon is displayed in the Tretyakov Gallery, Moscow in a functioning church in the grounds of the museum. Her feast day is June 23rd o.s. / July 6th n.s. Even more than most famous icons, the original has been copied repeatedly for centuries, and many copies have considerable artistic and religious significance of their own. Charles Lwanga (Luganda: Kaloli Lwanga was a Ugandan convert to the Catholic Church, who was martyred for his faith and is revered as a saint by both the Catholic Church and the Anglican Communion. The Uganda Martyrs are a group of 23 Anglican and 22 Catholic converts to Christianity in the historical kingdom of Buganda, now part of Uganda, who were executed between 31 January 1885 and 27 January 1887. ↑ Pernis & Adams 2006, p. 28. ↑ Bracher, Katherine (2014). "Ames, Adelaide". In Hockey, Thomas; Trimble, Virginia; Williams, Thomas R.; Bracher, Katherine; Jarrell, Richard A.; II, Jordan D. Marché; Palmeri, JoAnn; Green, Daniel W. E. Biographical Encyclopedia of Astronomers. Springer New York. p. 68. doi:10.1007/978-1-4419-9917-7_9217. ISBN 9781441999160. ↑ Davani, Catherine Anne. "Catherine Anne Davani - Curriculum Vitae" (PDF). Tribunal Arbitral du Sport / Court of Arbitration for Sport. Retrieved May 10, 2018. ↑ Stewart, Devin (2007). "The Identity of "the Muftī of Oran", Abū l-'Abbās Aḥmad b. Abī Jum'ah al-Maghrāwī al-Wahrānī". Al-Qanṭara. 27 (2): 279. doi:10.3989/alqantara.2006.v27.i2.2. ISSN 1988-2955. Wikimedia Commons has media related to June 3 .